There are many things that you can do to make your conference, trade show or convention booth stand out from the rest. You could have some colorful banners and signs, maybe some flashing lights or even somebody in a ridiculous costume grabbing people out of the crowd, though that may get a little weird. One of the best ways to draw attention to you and your booth, however, is by utilizing a video wall. A video wall is a set of plasma screens or monitors that you mount in order to allow multiple people to see what you are trying to show them or to add a little bit of flare to your booth. Colors ounce cialis free trial there have it find. cash outlay required for a video wall purchase. Having the option of making payments or only paying for the video wall for as long as you need it is one of the most alluring things about a video wall rental. It also allows you to be absolutely sure that everything will be ready and working on the day of your presentation, convention, trade show or conference. Rentacomputer.com has a plethora of video wall rental configurations including 2 x 2, 3 x 3, 4 x 4 and 5 x 5. However, if none of those seem like they will be sufficient for you and your booth then you can always get a custom configuration that is specifically tailored to your exact need. 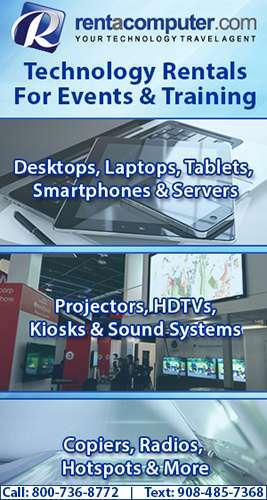 So the next time you are thinking about sprucing up your next trade show booth, consider a video wall rental from Rentacomputer.com. Local delivery and set up along with a professional installer that will be there to take everything off your hands when you are finished are just some of the alluring features of a video wall rental from Rentacomputer.com. Renting technology has its benefits, especially if you need something for a short period of time. But what if you need something for longer? What do you do if you need something for a year or two but you don't want to throw down on a permanent purchase? You lease, that's what and Rentacomputer.com is here to help. Rentacomputer.com has leasing opportunities that are flexible and longer than rental periods. With Rentacomputer.com you can lease an item anywhere from 1 to 5 years depending on your needs and then just send it back whenever you are finished. In addition to being flexible, there are also some other good reasons to lease. One reason is that it preserves bank credit lines. Leasing is an opportunity to preserve your credit lines and eliminate credit worries and hassles. Even though establishing credit in today's economic times is uncertain, leasing is still an option. Leasing is more convenient and efficient and you are only charged for what you use. In addition to preserving credit, leasing can also be cheaper, at least immediately. Many leasing options from Rentacompter.com offer little or no down payment, allowing you to receive your equipment without any worries about coming up with the money on the spot and draining a huge portion of your income. Leasing technology, like leasing a car, allows you to also have all the latest gear. By leasing you are guaranteed to have all the newest software and hardware at your disposal and the Tech Travel Agent you lease from can also make all the right recommendations based on your individual requirements. Rentacomputer.com also has a wide array of leasing products. With Rentacomputer.com you can get everything including a computer lease, audio/visual lease, office equipment lease, server lease or anything else you could possibly need. So the next time a big technological need is knocking at your door, why not try leasing what you need from Rentacomputer.com? By doing so you are ensured to have all the latest technology as well as an experience that will surely not disappoint.